I am Mark Radice and I live near Salisbury Wiltshire, a few miles from the ancient site of Stonehenge. I have been active in Astronomy since watching Comet Hykutake cross the sky while watching in Canada in 1996. This sparked off an interest that led me across the moon, through the solar system and out into deep space. 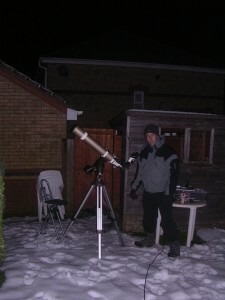 I enjoy visual observing, sketching, lunar and planetary imaging, solar observing and widefield photography. I am a generalist as I enjoy observing anything that is in the sky! Most of my observing is done with a 14″ f5 Skywatcher auto dob; a pair of 100mm APM binoculars a 4″ f9 Skywatcher ED refractor and a 60mm Lunt H-alpha solarscope. I am available to give Astronomy talks to schools, clubs etc. I have presented a number of talks to Astronomy clubs throughout the UK and the Kielder and Salisbury Star Parties. Please email me if you are interested: mark at refreshingviews dot com. 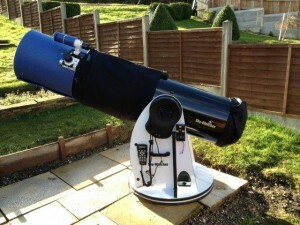 My primary instrument is a 14″ Newtonian reflector on a driven altaz mount. It is made by the ubiquitous Skywatcher and allows me to enjoy a (relatively) large aperture but with the benefits of tracking and GOTO in an affordable package. Having not used GOTO before, I must say I really am enjoying its benefits. I can observe a number of objects in one session, each one automatically placed in the field of view. The tracking then allows it to remain in the eyepiece or camera viewfinder even when doing high powered lunar or planetary observing. This does cause a certain amount of mocking from fellow members of our observing club. Having star hopped for a number of years, I know my way around the sky should battery or controller fail in the field. Interestingly, the primary mirror is a conical shape rather than a disc. This allows the mirror to be lighter and cool faster than a traditionally shaped mirror. I will mount a fan(s) behind the mirror to improve its cool down time. To my surprise, the scope needs 2kg of counterweights behind the mirror to maintain balance with an eyepiece – it’s too front heavy otherwise. Why this could not have been designed properly is beyond me. The downside to this ‘scope is the weight of the mount. It really is incredibly heavy, far too heavy for one person to lift. I have to carry the scope itself and then use a trolley to take the mount to/from the shed. It is impossible to lift into the car so I have to take the mount apart when I visit schools or our dark sky site. My plan is to build a lightweight plywood . 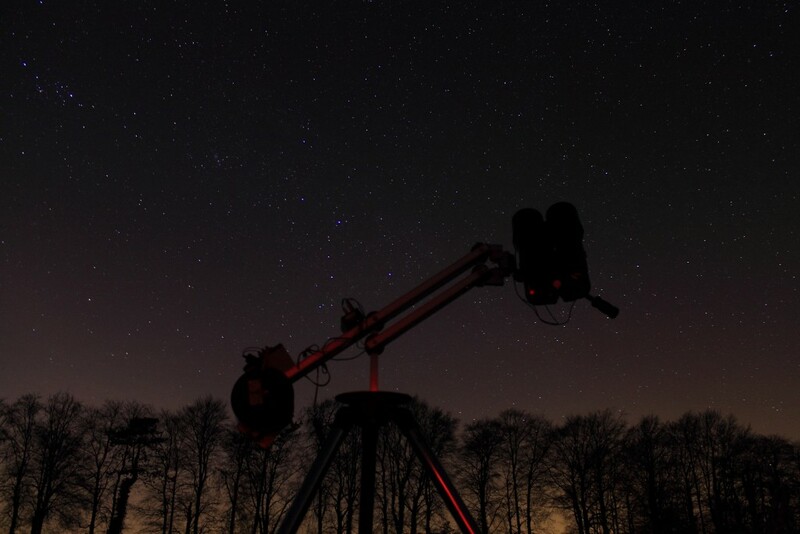 I can then leave the heavy (driven) mount in the observatory and use the lightweight mount when visiting. I really enjoy these large binos. 100mm aperture in both eyes with nice 19mm panoptics is simply fantastic. I can sit in comfort using either a homemade parallelogram mount or a camera tripod and scan across the sky without moving. 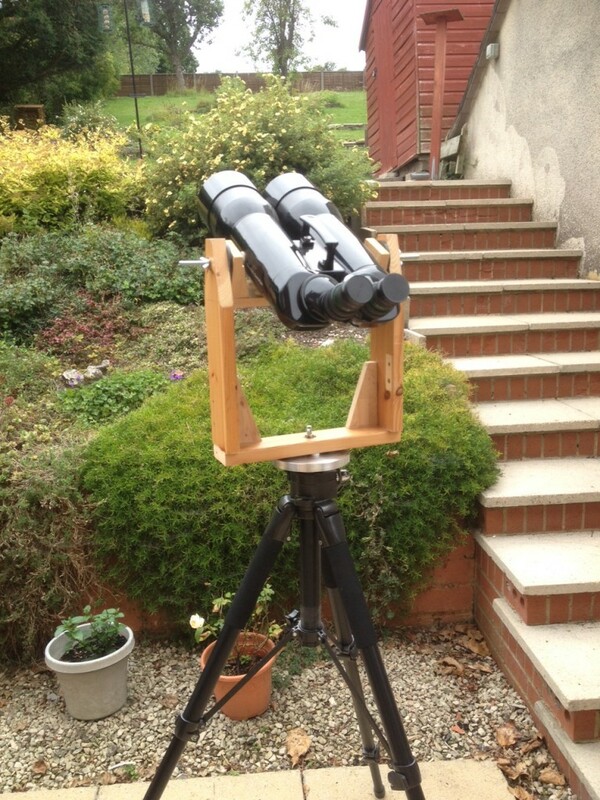 Further details are available in this article: Mounting Heavyweight Binoculars on a Camera Tripod. Exploring the milky way from our dark sky site with these is simple unbelievable. Star fields fill the eyepiece, laced by dark lanes of obscuring dust, interspaced with clusters and nebulosity. I did have an awful experience with APM when a part failed and damaged the optics internally. After much effort and persuasion on my part, they were reluctantly repaired back in the factory and have worked flawlessly since. This has left a rather bitter taste. Fantastic instrument but I still resent the way I was treated. I warn anyone who asks (and often those that don’t!) about the poor level of APM’s customer service. This is a shame as the binos are fantastic and a real pleasure to use.